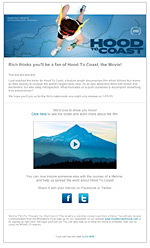 Hood to Coast Movie - Everyday people, extraordinary journey. 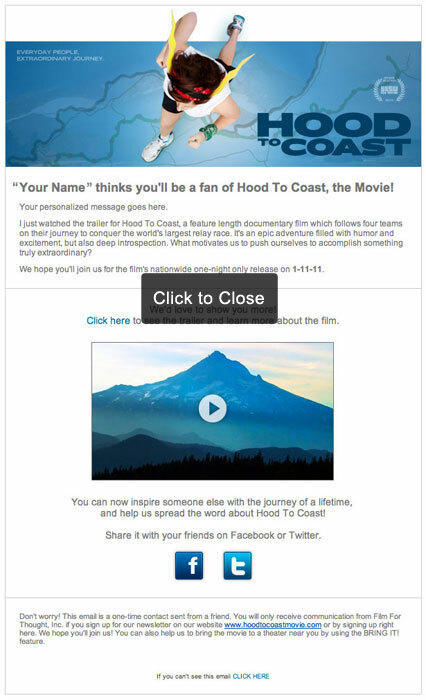 Share the Hood To Coast with your friends, family, teammates, and fellow runners by sending them an email so they can experience the acclaimed film themselves. Get your 2-Disc Special Edition DVD or Blu-ray for $14.99 now! Free shipping. Includes over 95 minutes of extras. Hood to Coast is one stunning sports film. We have a winner. Huge fan! Film For Thought in association with Run All Night Productions present a Christoph Baaden film, "Hood to Coast"
Run All Night Productions, www.hoodtocoastmovie.com, Film for Thought. © 2010 Film For Thought®, Inc.